So just a few months after Digimon Adventure Tri Reunion home release, Shout! Factory released Digimon Adventure Tri. : Determination, the second installment in the movie series. I remember watching Determination when it initially came out and ended up hating it. While typically I do love my slice of life in Digimon, Determination was really filler-y and it only made the story progress during the last 20 minutes of the movie. We waited four months for the movie to come out, and we had to wait for another six to see the third one, so it was frustrating. However, considering this Blu-Ray set came out after I watched the third and fourth movie via Crunchyroll – which both developed the story some more, going back to Determination was more enjoyable, almost like the same effect you get when you watch a series in one sitting versus watching it on a weekly basis, or in this case, every four or six months. The movie starts with Leomon protecting Primary Village from an infected Ogremon, who has broken the Digi-Eggs. 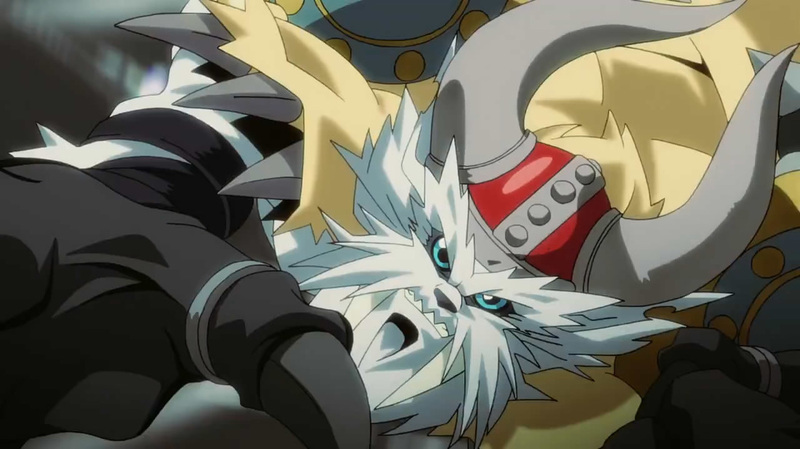 Ogremon injures Leomon and then runs away, with the latter chasing him while being observed by the Digimon Emperor, who is assumed to be Ken Ichiouji throughout the movie. Later in the real world, the whole gang, save for Joe, gather up to celebrate the addition of their newest member Meiko Mochizuki and her Digimon partner, Meicoomon, by going to the Ooedo-Onsen-Monogatari hot springs. As filler-y as this part was, I enjoyed this part of the movie. During my first watch, it was frustrating because we basically got nothing out of the movie. However, this scene grew on me when I saw it the second time. If you watched the trailers or saw the cover of the movie, you already know that this is the debut of Mimi’s Rosemon and Joe’s Vikemon in anime form. I’ll start with Joe, who I said I was going to elaborate on in my previous review. Joe got a lot of character development during the first series, and even though he got the least screen time, alongside Mimi in Adventure 02, he was shown to be a mature and dependable character. I get that Japanese students struggle with getting into a good university (it’s not a foreign concept in the western world either), but I felt like his character has regressed for the sake of giving him a conflict to overcome and for Gomamon to gain his Ultimate form (otherwise known as Mega). His conflict was valid but it felt forced and convenient, and it took one of the youngest from the group as well for him to realize his friendship with Gomamon, and what was at stake. Digimon Tri Abridged addressed this issue a lot better, but I digress. As for Mimi, her struggles felt more natural and in character. Despite her good intentions, she is the type of character who would act on her own without the concern of her teammates. This is shown during her fight with Ogremon and how she endangered the nearby civilians. I was fine with that, but this was also shown during the filler-y school festival, which took another chunk of the movie. It was enjoyable and cute but I wish it was shorter. Both struggles had a purpose but I feel like it could have been handled better (like Koushiro’s in the following movie), which I will address in that review. I’m sure I’m not the only one who is annoyed by the fact that the 02 kids are missing since the former Chosen Children aren’t concerned about their whereabouts. They assumed that the Digimon Emperor was Ken but didn’t bother asking "how," and even most importantly “Why?” Even after the fight with Imperialdramon, they acted as if Ken didn’t join the good side and they didn’t mention the other kids at all. It doesn’t make sense to imply they exist but making the cast act as if they didn’t. In terms of the features included in this Blu-ray set, the film comes with subtitles for both the Japanese audio track and the English dub. Instead of interviews with the English cast and director, we get an inside look at the ADR Director and Engineer, along with the English cast going over the process of how the dubbing is made. I wish this movie came out in theaters like the first movie. Even though it has been a whole year since it came out, I’m still a bit salty that I missed out because of technical difficulties and I have yet to see a Digimon movie in theaters. If you want to support the localization of Digimon, I recommend getting Determination.